Hitch and I took Highway 12, a little less than 4 miles beyond the SR-63 turn-off. 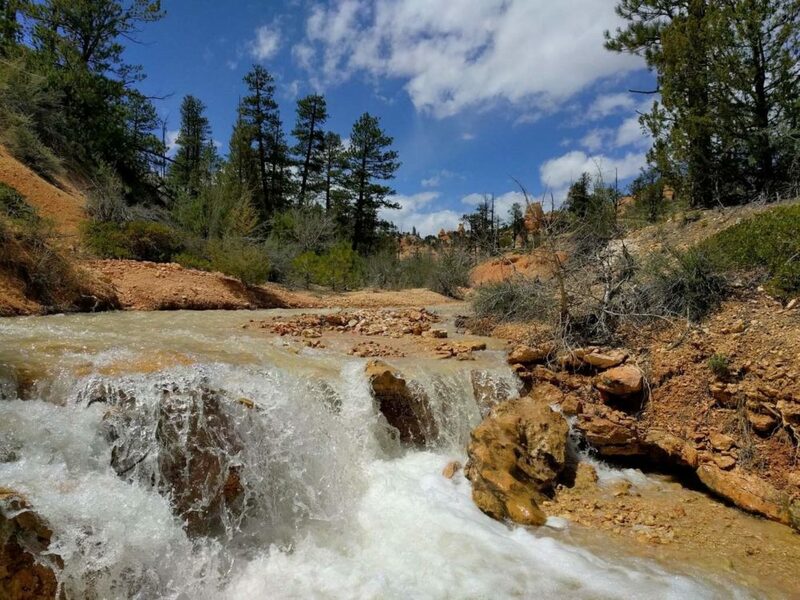 I found this hike exceedingly pleasant, with its perennial creek flowing parallel to the trail. The terrain mostly flat for about a mile and less frequented by tourists. 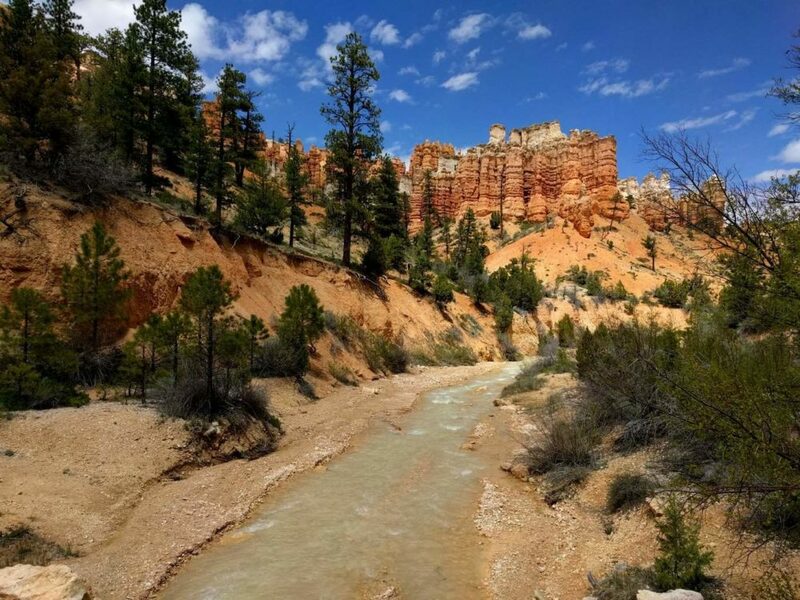 The bubbling creek meanders through Water Canyon and is a landscape filled with wondrously tall red spires. There are two bridges, but at the first crossing, there is a wonderful view of natural arches and window walls in the cliffs. Beyond the second bridge, and after a short climb, we took a right at the T-section onto the waterfall. At the kiosk, I learn that the water flow here is not natural. Pioneers diverted the water from Sevier River into Water Canyon via a series of canals to feed the farmlands around the town of Tropic. The canal itself is called the Tropic Ditch. 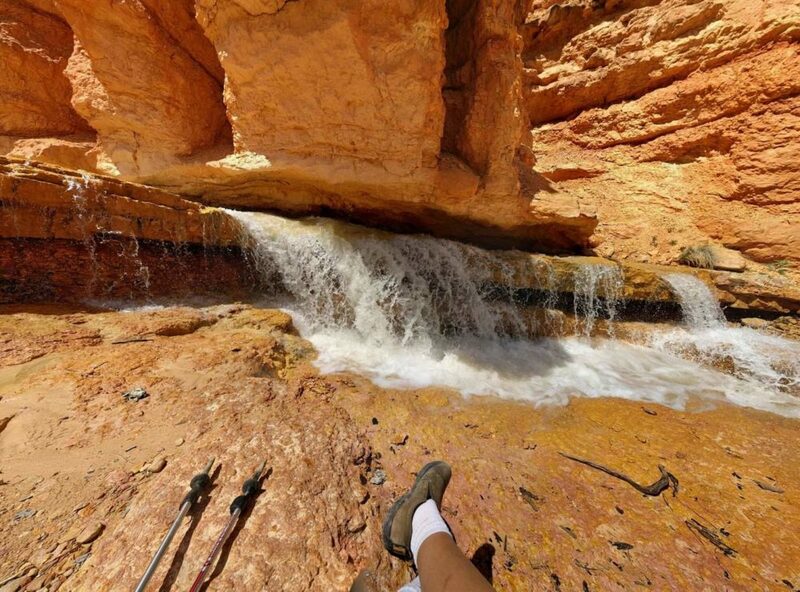 The water falls 10 feet, over a ledge into a circular pool. 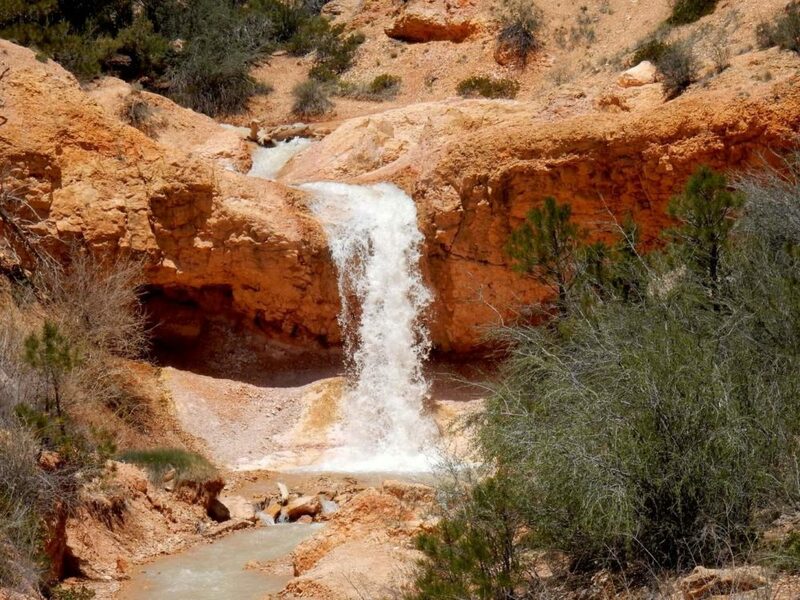 We reach above the drop, and I notice that the water swirls quickly in a channel and several quite deep potholes, formed by the water eroding into the soft, orange-colored limestone. The water looks fast and swollen from snow melt and rainfall. There are signs forbidding us from crossing and climbing up to the windowed walls and red arches. So we continue walking along the banks of the stream beyond the 10-foot tall waterfall along a well defined but unmaintained route. I’m curious and trek on upstream. The water lovely and cools the heated air. 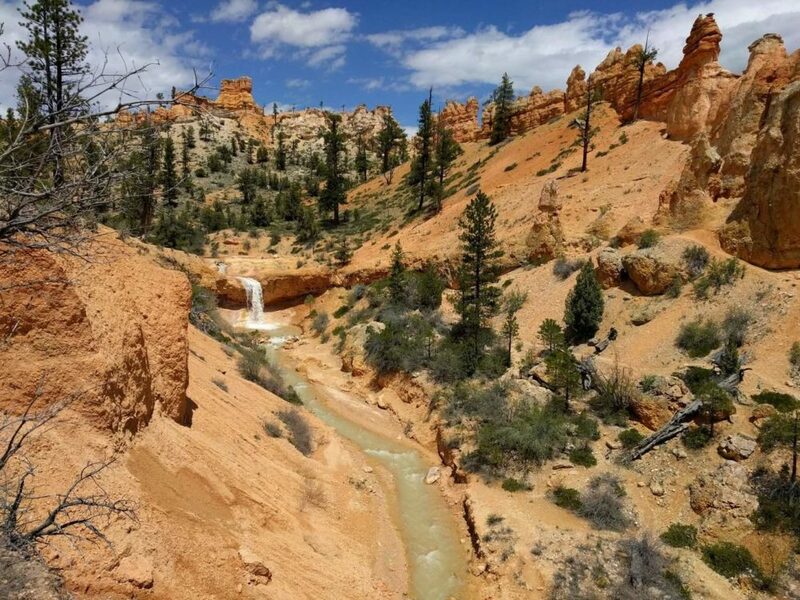 We find more brilliantly red rocky spires, and a second shorter waterfall. 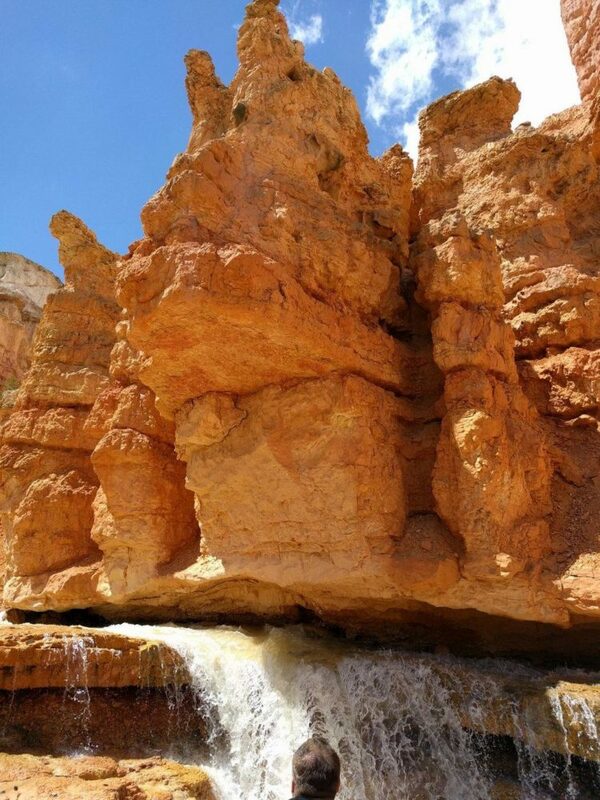 The water here seems to erode under a the spires before falling to the lower level. I dip my fingers into the water and discover that it’s rather soapy feeling. Perhaps from the dissolved lime rock? I find the solitude here lovely. Even the birds seem to be enjoying themselves here. We continue forward and upstream but are impeded by the stream itself. The rest of the trail is cut off due to the swell of the water. We head back toward to the T-Section of the trail to see the Mossy Cave itself. The left fork is a short but steep climb through a patch of pine woodland. 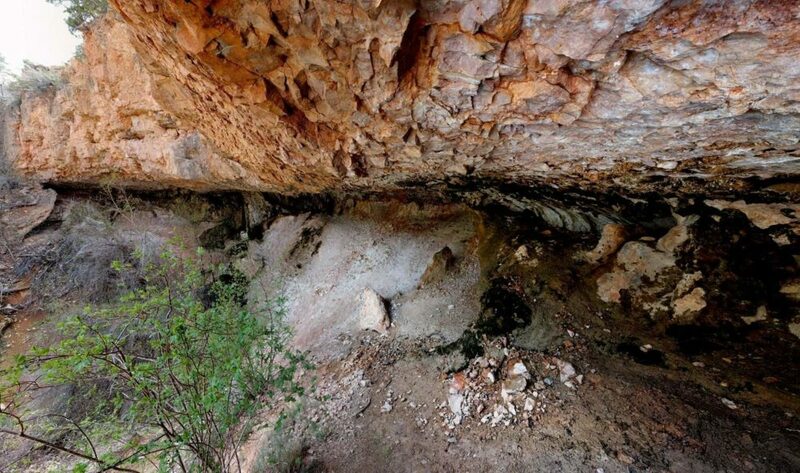 The cave is actually just a wide, mossy overhang in the Claron limestone. It’s kept moist by water dripping from the ceiling. The sign indicates that it is a seep where rainwater is stored within the earth before find its way back to the or “seeping back up” to surface. In the winter, large ice pillars form beneath the cave lip, sometimes not melting until well into July due to its shadowed shelter. The soil at the base of the grotto is often soft and muddy so the path ends at the edge. I can see delicate hanging gardens of moss and understand why they don’t let people wander into the cave: it’s a delicate ecosystem easily ruined by one step let alone hundreds of tourists. 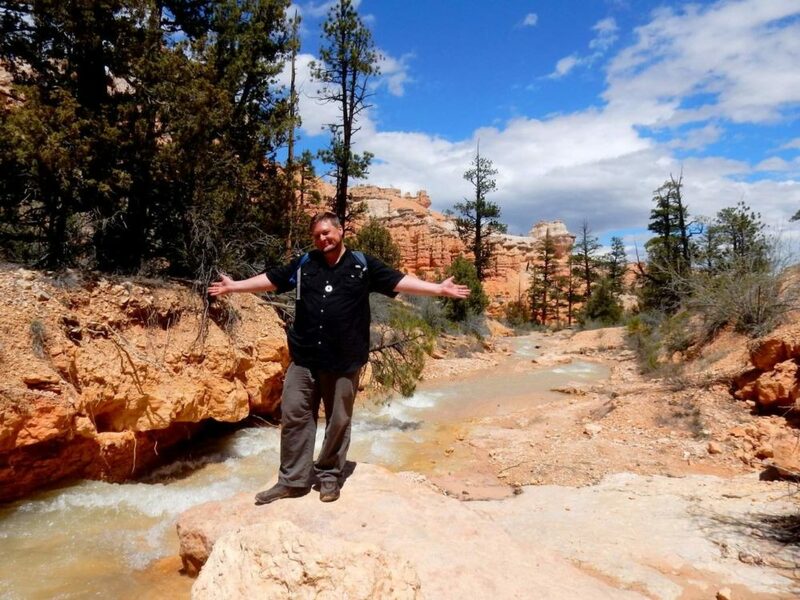 I’m deeply satisfied by this hike, mostly because of the stream and the wonderful rock formations nearby. I reluctantly head back to the truck. 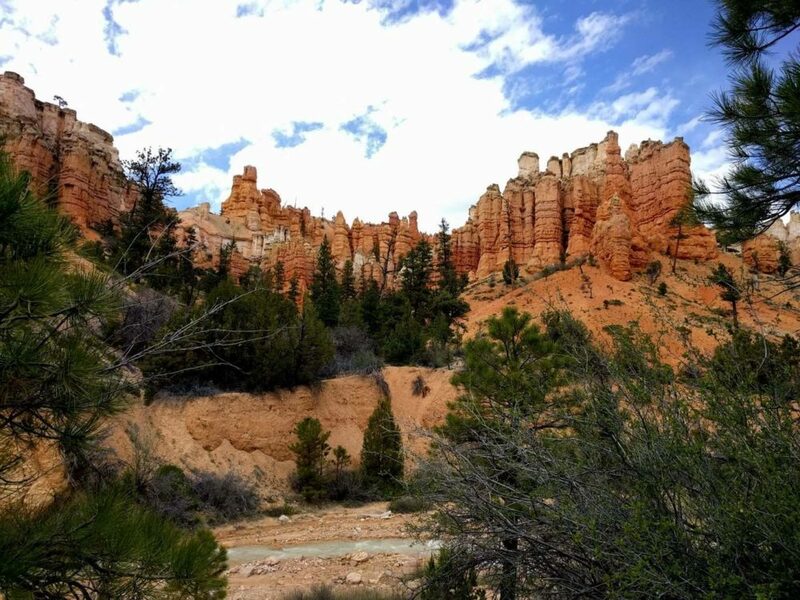 There’s one more view I wish to see before leaving Bryce Canyon. 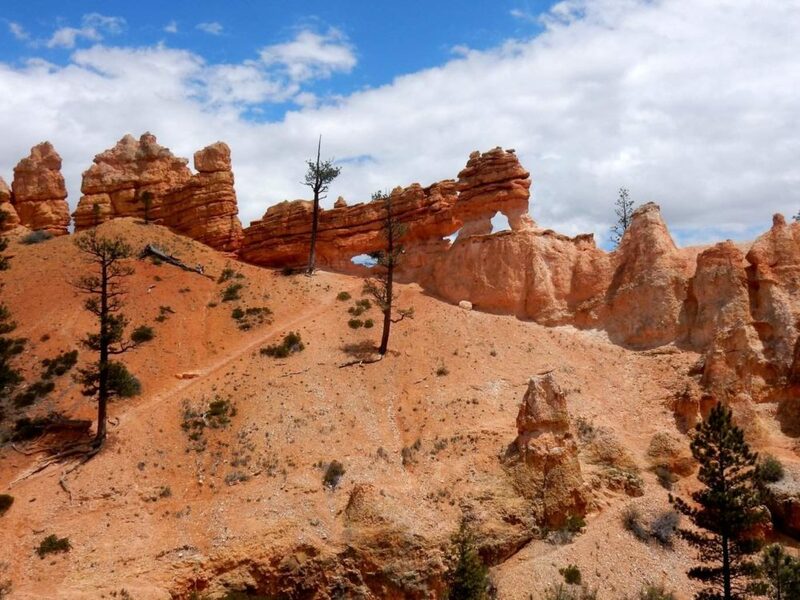 The Fairyland Loop Trail is one of the best-kept secrets about Bryce Canyon. Located at the far northern tip of the park, most of the tourists blow right past Fairyland on their quest for car accessible Bryce overlooks. So Fairyland is a hikers dream. 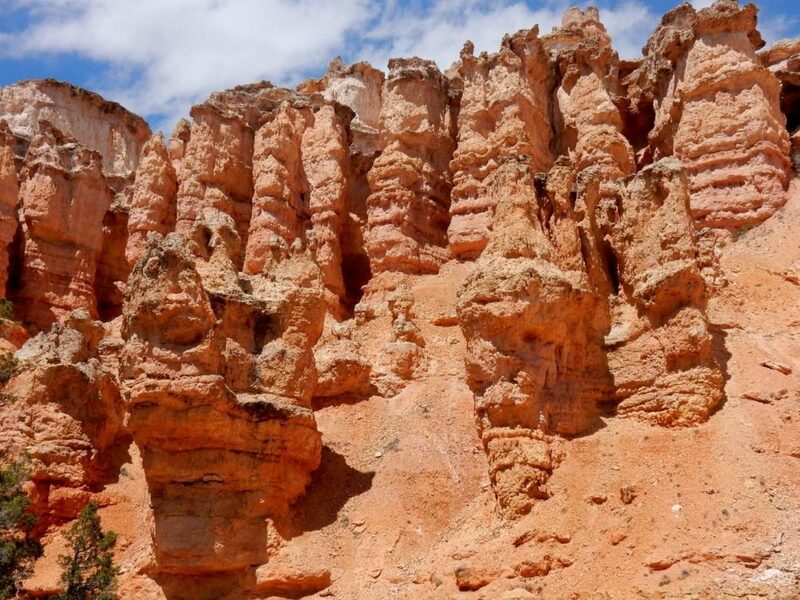 It’s considered a strenuous hike with an elevation change of over 1500 feet as you go down into the canyon. With a total distance of over 8 miles, we don’t have time to hike it nor the stamina. But the view from the overlook is dazzling and especially at sunset. The turn-off toward Fairyland is about one mile before the visitor center. From the turn-off, it’s another mile through ponderosa pine and fields of grass to the viewpoint and trailhead. We drove slowly and spotted a few Pronghorn and deer prancing about the trees. The view here is just as good as the main amphitheater, with fewer crowds as a bonus. At the trailhead saying sturdy boots are necessary for this hike, and then I remember a warning back at the visitor center informing tourists that the number one emergency calls for ranger rescues on trail are injured feet and angles due to bad shoes. 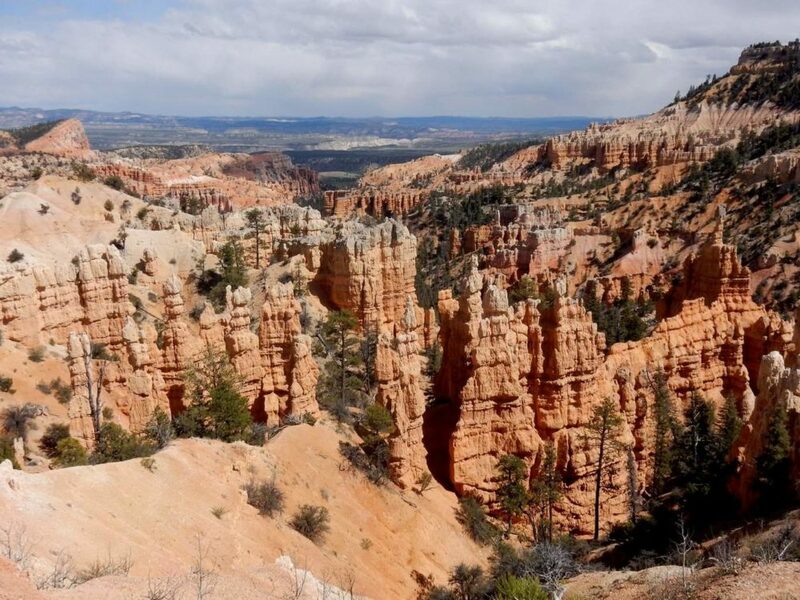 I walk a few dozen feet from the overlook proper to an overlook near the rim. I find a nice ponderosa pine to sit under. My hands skirt the bark and I discover a tiny bronze plaque marking the site to one beloved mother named Irma who died in 2005. I guess this is where her ashes were laid by her loved ones. I sit quietly to enjoy the view and a wonderful cooling breeze. I fine place to rest indeed.